Analyzing the mix of shoppers and the characteristics of each neighborhood with your historical sales data, MetroPulse recommends changes to the assortment plans, and indicates the predicted impact on revenue and profit. Category affinity analysis calculates the impact the removal or addition of a SKU will have on the net sales or profit performance of that category; taking into account any halo effect or cannibalization impact on other SKUs. Using demand drivers such as weather forecasts, local events or holidays, demand forecasts are dynamically updated by store and by product. Orders can be adjusted accordingly, to avoid excess inventory or out-of-stocks. Whether a display asset or a new store, the optimum location is recommended through the analysis of internal and third party data. 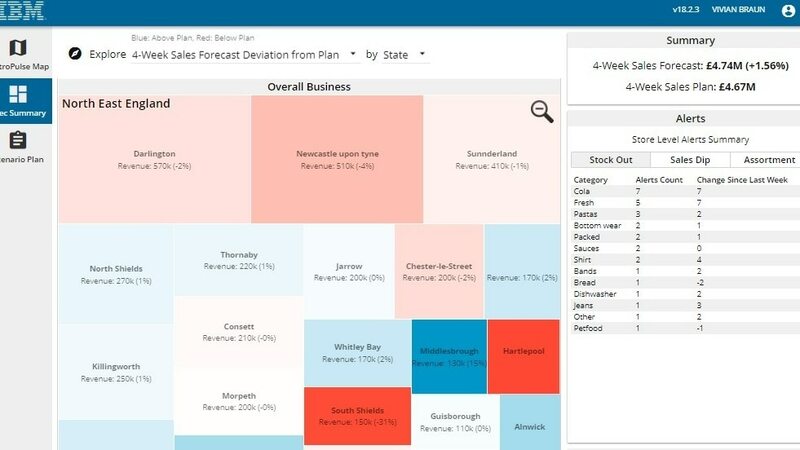 The dashboard surfaces opportunities and issues identified through the modeling of all available data, allowing senior decision makers to have an overview of the financial impact of each event, and prioritize the action taking. The ability to integrate with leading enterprise resource planning systems such as SAP offers users the ability to swiftly take action on the insights, adjusting order volumes to match predicted, local demand. Our services help you understand the data and how it can help you predict, optimize and transform your business processes and business strategy. There are no software requirements for IBM MetroPulse. There are no hardware requirements for IBM MetroPulse. IBM MetroPulse modules are SaaS offerings accessible via a web application deployed on IBM Cloud. Certain data requirements apply. The advanced analytical modules that analyze third party data with your enterprise data require your data in a specific format - for further details please use the ‘request a consultation’ form or reach out to your IBM representative.